BEAUTIFUL CONDITION studio at the ever-popular Arts Condo. Enjoy this corner unit with ample windows offering great views. This is one of the larger studios at the Arts and it includes Central Air (which most Arts units do not!). And ALL utilities and Comcast Cable TV are included; that means heat, electric, central air, water, hot water and cable TV are INCLUDED in your Condo Fee! 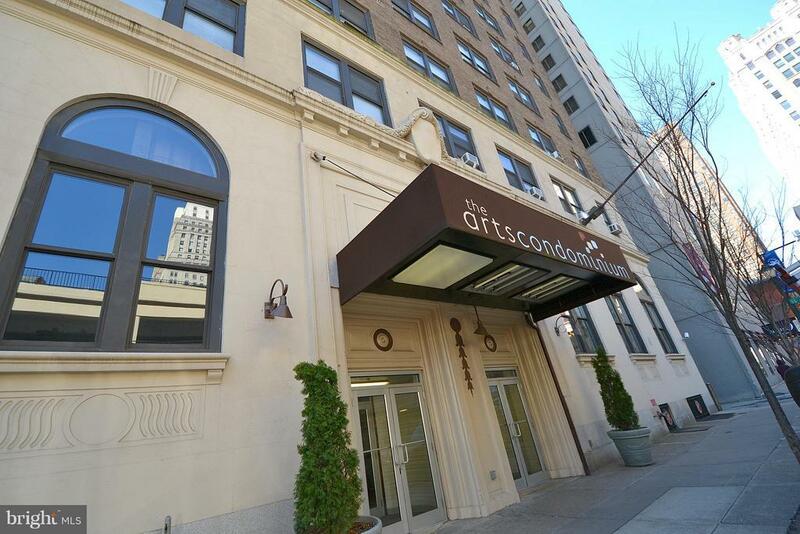 The Arts offers a premier location, right on the Avenue of the Arts and convenient to all Center City has to offer and every hospital and University. The building has professional on-site management and maintenance staff and first-class amenities, including 24 hour front desk person who sits in a most beautiful, grand lobby, fitness center, clean laundry room with ample modern machines, bicycle storage, lobby WiFi (and internet kiosks! ), and a business room. This unit has also been continuously rented and is an income-producing property. Building requires a $250 move-in fee (no move out fee).